I went to bed early Wednesday night and I wish I had not. I mean I needed to be at work early the next morning. Since I am not a morning person, regardless of how much sleep I get, I knew I needed to go ahead and get some shut eye. I was watching the end of the second quarter between the San Antonio Spurs and the Los Angeles Clippers. It was a tight game that could either way. However, what was most intriguing about the game was the immortal Tim Duncan. Timmy was being Timmy. In the first half, he was seven of eight from the floor for 16 points. He was tossing in floaters, posting up one the the league’s best defenders, DeAndre Jordan, and he was creating space to allow his teammates to knock down easy baskets. For some reason, the Twitterverse was shocked. I was more shocked to see Steve Blake still in the league playing for the Portland Trailblazers. There was absolutely nothing shocking about Timmy doing the same thing he has been doing for the past 17 years. Were people shocked because he will be 39 on Saturday? Were people shocked because he plays for the Spurs, a team many label as boring? Or were people simply shocked because it was Tim Duncan. Those people made me laugh. If it was Kobe Bryant or LeBron James or Kevin Durant, shock would be the furthest thing from their mind. 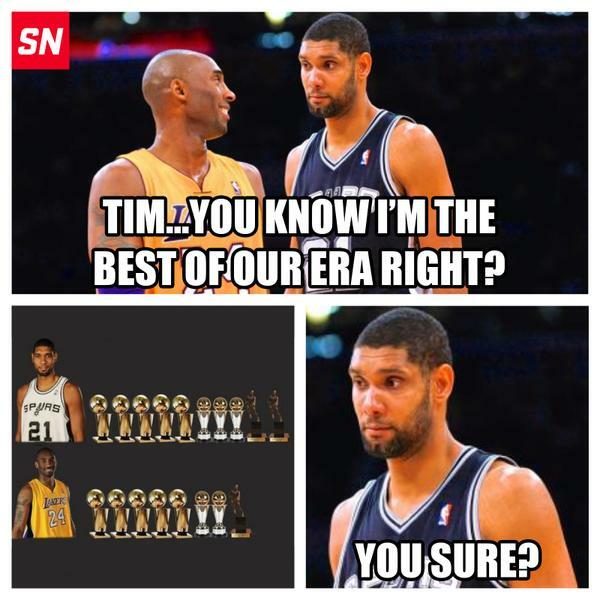 Newsflash, ain’t nobody doing what Timmy has done for as long as he has done it. The man is immortal. He barely ages. His energy level has barely diminished. And after watching him play last night, I am convinced that he is capable of catching up with Michael Jordan this year in the rings department. For 17 years we have been witnessing greatness and we better embrace it while he is still dishing it out. He has stayed true to himself since he raced up and down he courts at Wake Forest. He will not draw you in with his cockiness. He has none. He will not draw you in with his outward display of emotion. It is rare that you see it. He will not wow you at a press conference. He is not a many of many words. Where he will wow you is on the court. Watching him play makes me smile. His fundamentals are some of the purest I have ever seen.